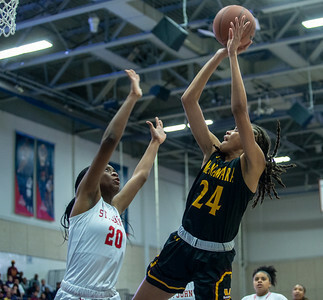 Washington, DC, Monday, February 25, 2019: Bishop McNamara Lady Mustangs Madison Scott (24) takes a shot over St. John's Lady Cadets Malu Tshitenge Mutombo (20)during the Girl's WCAC 2019 Basketball Championship game between St. John's and Bishop McNamara held at Bender Arena in Washington, DC. (Michael R. Smith/The Prince George's Sentinel). 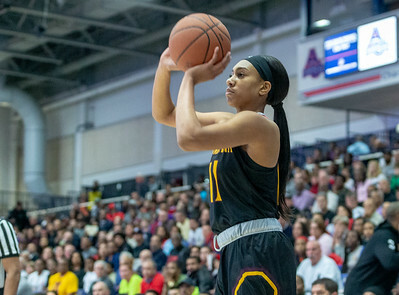 Washington, DC, Monday, February 25, 2019: Bishop McNamara Lady Mustangs Jakia Brown-Turner (11) takes a shot in the 1st quarter during the Girl's WCAC 2019 Basketball Championship game between St. John's and Bishop McNamara held at Bender Arena in Washington, DC. (Michael R. Smith/The Prince George's Sentinel). 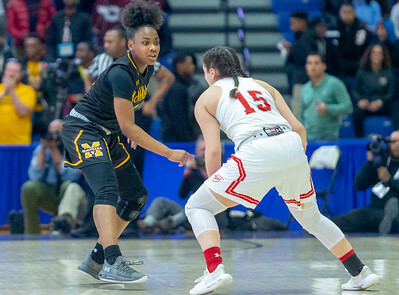 Washington, DC, Monday, February 25, 2019: Bishop McNamara Lady Mustangs Yonta Vaughn (5) plays defense against St. John's Lady Cadets Carly Rivera (15) during the Girl's WCAC 2019 Basketball Championship game between St. John's and Bishop McNamara held at Bender Arena in Washington, DC. (Michael R. Smith/The Prince George's Sentinel). 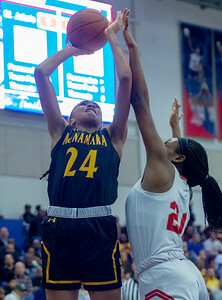 Washington, DC, Monday, February 25, 2019: Bishop McNamara Lady Mustangs Madison Scott (24) puts up a shot against St. John's Lady Cadets Malu Tshitenge Mutombo (20) during the Girl's WCAC 2019 Basketball Championship game between St. John's and Bishop McNamara held at Bender Arena in Washington, DC. (Michael R. Smith/The Prince George's Sentinel). 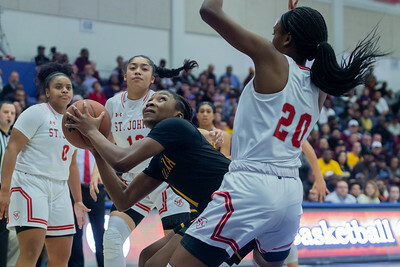 Washington, DC, Monday, February 25, 2019: Bishop McNamara Lady Mustangs Jakia Brown-Turner (11) takes a shot over the out-stretched hand of St. John's Lady Cadets Azzi Fudd (35) during the Girl's WCAC 2019 Basketball Championship game between St. John's and Bishop McNamara held at Bender Arena in Washington, DC. (Michael R. Smith/The Prince George's Sentinel). 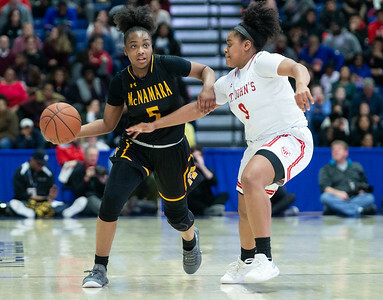 Washington, DC, Monday, February 25, 2019: Bishop McNamara Lady Mustangs Liatu King (1) looks for room against St. John's Lady Cadets Malu Tshitenge (20) during the Girl's WCAC 2019 Basketball Championship game between St. John's and Bishop McNamara held at Bender Arena in Washington, DC. (Michael R. Smith/The Prince George's Sentinel). 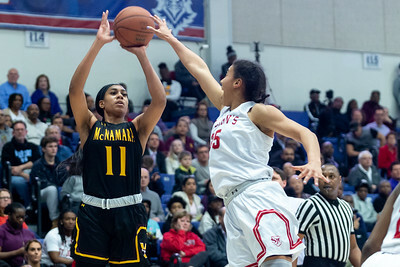 Washington, DC, Monday, February 25, 2019: Bishop McNamara Lady Mustangs Yonta Vaughn (5) looks to make a pass while being pressured by St. John's Lady Cadets Alex Cowan (0) during the Girl's WCAC 2019 Basketball Championship game between St. John's and Bishop McNamara held at Bender Arena in Washington, DC. (Michael R. Smith/The Prince George's Sentinel).